Please forgive me if the title of this post sounds like the condescending musings of an old fart grumbling about “the youth of today”. I suppose that’s what I am, even if I don’t want it to sound that way. And perhaps I’m writing for other old farts who think that Julius Malema is a bumptious young whippersnapper who still has a lot to learn. But I’m not as old as Robert Mugabe, and Julius Malema has rumbled him. And he’s seen through Jake the Fake. Julius Malema has shown that he can, and does, learn from experience, which crusty old farts like Jake the Fake and Mad Bob Mugabe evidently don’t. The Zimbabwe government has lambasted EFF leader, Julius Malema for being a coward. The Mugabe led-government simply described Malema as a “young and impressionable” leader; who has turned himself into a weapon that fights against liberation movements “on behalf of imperialism”. How’s that for a bunch of old farts telling a young whippersnapper to grow up? But compare and contrast that with what happened when Julius Malema visited Zimbabwe only six years ago. There’s a big difference. Politicians have always employed performative techniques, to rally and garner support from their constituencies. Clive Gaser suggests that there has always been a sense of militancy in the conduct of leaders of the Youth League — performativity is not only specific to Malema. 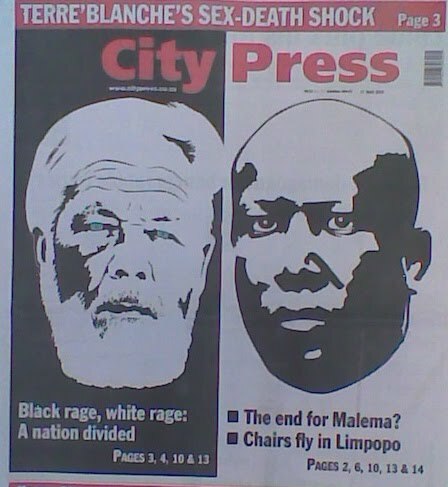 It was apparent in Malema’s predecessors. The African National Congress should stop using the apartheid legacy for not delivering services to the people, Economic Freedom Fighters leader Julius Malema said on Sunday. Speaking at an EFF August 3 municipal elections rally at the Zamdela Stadium in Sasolburg in the Free State, Malema lambasted the ANC leadership, saying the party was still using the apartheid legacy to cover incompetency and did not “care about black people”. Apartheid is to blame for many things, but poor service delivery in municipalities that the ANC has controlled for the last 15 years is not one of them. For example, in the City of Tshwane, where I live, rubbish collection has been outsourced and privatised in the approved Thatcherist fashion. That was done by the ANC. Some time ago the municipality introduced wheelie bins and specialised rubbish collection lorries to pick them up in an automated process. The lorries were designed to compact the rubbish so that they would have to make fewer wasteful trips to the dump. Since the rubbish collection was privatised, it has gradually reverted to a much more primitive process. Some rubbish lorries are simply a cage made of diamond-mesh fencing, into which the bins are manually emptied. Even some of the purpose-built ones look old and badly maintained. The reason is not far to seek. If you tender for a rubbish-collection contract for three years, and it is uncertain whether it will be renewed after that period, but it might be given to someone else, there is little point in investing in specialised equipment. If you don’t get the contract, who will you sell it to? If the contract isn’t renewed, that cuts your losses. Of course if the contract isn’t renewed, the workers might also lose their jobs. By their very nature, contractors for such services are inclined to employ casual labour, so the workers are unlikely to have such benefits as pensions or medical aid or job security. This was done by the ANC; it was not done in the apartheid period. The Tshwane Municipality has done some good things too, and I think it is one of the better-run municipalities in the country, but failures in service delivery in 2016 are not the fault of apartheid. So it seems to me that though in the past Julius Malema took a shotgun approach to identifying problems, just blasting away in the hope that something would hit the target, he is now adopting a more pinpoint approach, trying to identify the real cause. I don’t know if the EFF will control any municipalities after the local government elections on 3 August, but even if they don’t control any, they could be useful watchdogs, keeping the other councillors on their toes. I suppose the best way to describe the genre of this novel is a Bildungsroman, set in the time of Zimbabwe’s Second Chimurenga, forty years ago. Was it as long ago as that? And the author wasn’t even born then. Tinashe is a young Shona boy who grows up in a rural village, ocasionally visited by his rich uncle from the city and his cousin. He dreams of going to school and university, like his uncle, but his cousin doesn’t seem to value these things. Tinashe’s younger sister, Hazvinei, is strange, and communes with spirits. Her brother, and other people, sometimes find her rather frightening, but he feels obliged to care for her, even when it threatens to disrupt his education. In some ways it is like an African version of David Copperfield or The catcher in the rye, but it is also bound up with the surreal and unpredictabe world of Shona mythology, where the spirits can make people feel invincible at one moment and dash all their hopes the next. The African Union has appointed Robert Mugabe as a mediator in the Ivory Coast crisis. The mind boggles. Perhaps he’ll use it as an opportunity prepare to flee there when the Zimbabwe people rise up like those of Egypt and Tunisia to toss him out. TYRANT Robert Mugabe is among African leaders chosen to mediate in the Ivory Coast crisis, it has emerged. The African Union decided to appoint Mugabe and a panel of leaders to join Prime Minister Raila Odinga in the Ivory Coast crisis. The panel includes Presidents Jacob Zuma (South Africa), Jonathan Goodluck (Nigeria), Robert Mugabe (Zimbabwe) and the President of Mauritania among others and Ping said the mediation already undertaken by Kenyan Prime Minister Raila Odinga was part of the building stones towards achieving a realizable goal of peace in Ivory Coast. Tinyiko Sam Maluleke’s Blog: South African Public Sector Strike: The Beginning of the End? I didn’t notice the public servants’ stike much, perhaps because I don’t get out a lot, especially since my car wouldn’t start for a few weeks and I had to save up for a new battery. So it’s just the snippets I’ve caught on the news that have made me aware of it. But blogs now provide an alternative to the mainstream media, and I think some of my blogging friends hav said things worth sharing. In the end we went in and out quite uneventfully. I know that the strikers want more money, but I can’t see the justice in allowing helpless people to suffer as a tool to get their own way. I have an ambivalent feeling about this. I feel sorry for neglected patients in hospitals, and feel that it is irresponsible to neglect them. At the same time, I wouldn’t want to be a scab. Yes, the strikes are about money, but there’s something deeper going on – something at the relational level. The mere occurence of a strike, it could be argued, bears evidence of relational breakdown. Then there are relational implications in the huge earnings differentials between top and bottom public service officials – it says something about how people are valued. Intimidation and violence only occur where relational capacity is already damaged, and they certainly effect little that is relationally redemptive. It might not be enough to address the money issues without addressing the relational issues. Justice is a complex matter, but at its heart, justice has to be relational. And lurking behind all this is what is going on to the north of us, in Zimbabwe. Tinyiko Maluleke mentions the strains in the tripartite alliance between the ANC, Cosatu and the Communist Party. In Zimbabwe the relationship between the government and the trade unions lies shattered, and all Thabo’s horses and all Thabo’s men couldn’t put Humpty Dumpty together again. Is the same thing happening here? When it happened in Zim, millions of refugees came here. If it happens here, where will they, and we, go? Chavez’s policies have reduced ignorance, poverty, and injustice. The list goes on and on. Venezuelans are more engaged in the political process than anytime in the nation’s history. That scares Washington. US elites don’t want well-informed, empowered people participating in the political process. They believe that task should be left to the venal politicians chosen by corporate bosses and top-hat banksters. That’s why Chavez has to go. He’s given people hope for a better life. Hat-tip to Neil Clark: Why Washington hates Hugo Chavez. I take this praise of Chavez with a fairly large pinche of salt, just as I do the Washington spin on him. Yes, Washington and the US media have tried to portray him as the bad guy, without much evidence. But I’m a bit sceptical about these attempts to portray him as an altogether good guy. I suspect that, like most politicians, he is a mixture of good and bad, though in his case the good may outweigh the bad. The main reason for my scepticism about Chavez’s goodness is that he has been reported as thinking that Robert Mugabe of Zimbabwe is one of the good guys. Anyone who thinks that has severely impaired political judgement, and if that is his view, then there is surely some truth in the bad vibes about him emanating from Washington. … then the opposite is true of Mugabe. Mugabe’s policies have increased ignorance, poverty, and injustice. The list goes on and on. Zimbabweans are more victimised in the political process than at any time in the nation’s history, even under Smith. That’s why Mugabe has to go. He’s given people no hope for a better life. It used to be said that one good thing that could be said of Mussolini was that he made the trains run on time. I doubt that Mugabe has accomplished even that. If Chavez supports a dictator like Mugabe there must be something seriously wrong with Chavez. What’s the similarity between politicians and a bunch of bananas? They’re all yellow, they hang together, and there’s not a straight one among them. One of the most prominent political figures in the turbulent years before the independence of Zimbabwe, Bishop Abel Muzorewa, has died, aged 85. He was seen by many as a moderate black leader at a time of extreme political change. But black militants saw him as a puppet of white politicians. Bishop Muzorewa entered politics in the 1970s when nationalist politicians were either imprisoned or in exile. After Zimbabwe’s independence, Bishop Abel Muzorewa was virtually forgotten by the outside world, yet in the 1970s he played a similar role in Ian Smith’s Rhodesia to that of Anglican Archbishop Desmond Tutu and Allan Boesak in South Africa in the 1980s. In the 1970s most opposition leaders in Rhodesia were in jail or in exile, and Muzorewa’s African National Council revived the internal opposition to the Smith regime in much the same way as the United Democratic Front (UDF) did in South Africa. The difference was that towards the end of the 1970s Muzorewa allowed himself to be co-opted by the Smith regime, entering a coalition government. But today history is repeating itself as opposition leader Morgan Tsvangirai, of the Movement for Democratic Change, has similarly allowed himself to be coopted by the Mugabe regime.